The Euromaidan protests in Ukraine, which have swollen the streets of Kiev like a water balloon fit to burst, have been both physical and vocal. In recent weeks thousands of protesters, many of them supporters of the opposition, have filled the main square shouting for political change. Calls for embattled President Viktor Yanukovych to step down continue to bellow into the night amid bloody fighting and clashes with police. The National Art Museum of Ukraine made headlines recently, but perhaps not for what was inside it. The entrance steps of the heritage site were set ablaze as protesters turned violent in an increasingly escalating political standoff. It resulted in a public appeal from museum director Maria Zadorozhna to "spare the important cultural site", though that did little to dampen the mass anger outside the museum doors. At the end of last year, young artists drew a line in the sand when the Ukrainian administration rejected a European Union proposal for integration. Rumours of people being imprisoned for standing up to their government spurred on an artistic movement. It can be seen in the 70 or so galleries dotted around Kiev, in the international fairs that are waking up to Ukrainian contemporary art and most of all, it can be seen on city walls. Banksy-style stencils portraying Yanukovych with bloodied bullet holes in his forehead are peppered around the city, whilst crossed-out swastikas and slogans like “BIG BROTHER IS WATCHING YOU” continue to appear in Kiev’s main square. As demonstrated by the graffiti on Damascus walls during the Syrian uprising, a country’s art can also be a barometer of a changing social conscious. Artist and activist Nikita Kadan has been outspoken in his dislike for the nationalist rhetoric governing his country. He has become known for making art that depict viciousness and social injustice. 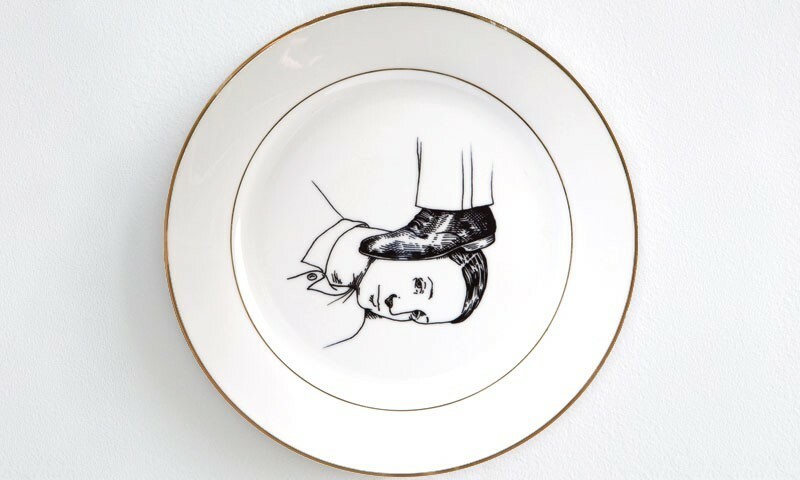 His series Procedure Room comprises of a set of souvenir plates are printed with drawings of police brutality coupled with phrases like “invisible” and “in the shadows”. “The figures in these drawings have a silent smile,” Kadan says, “as if they were acknowledging torture is like a medical procedure that the state does to its citizens.” He is as much a provocateur as the work he makes. He is a member of Hudrada, a creative collective that is known for its run-ins with the police due to its protests against the privatisation of public space in new development projects, as well as its clashes with the Ukrainian Commission to Defend Public Morality, a state censorship authority. In 2004 he founded the artist group R.E.P. 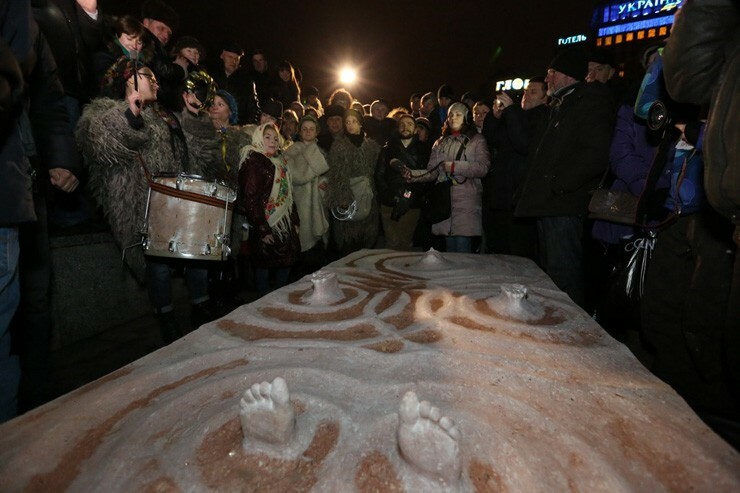 (Revolutionary Experimental Space), which attempts to use art to draw public attention to issues such as corruption, violations of human rights and abuse of power in the Ukraine. 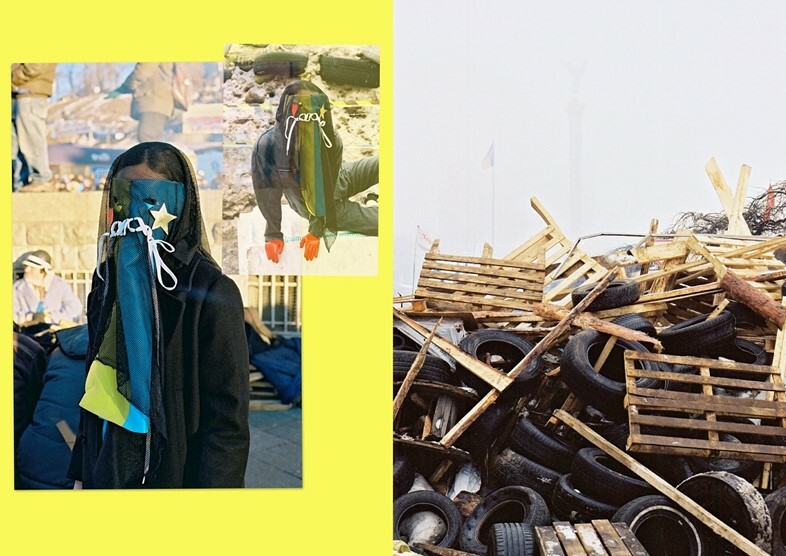 “From the streets to gallery walls, lines are being blurred between protest and art, activism and installation"
Artem Volokitin has been a strong advocate for art from Ukraine. At just 33 years of age, he is already regarded as an accomplished artist in his homeland. His pictures depict naked or semi-naked young men and women, people who he calls “heroes” – and the reason they are naked? “Because the clothing gives away a person’s status in life,” he says. The country’s underserved artistic youth have begun to question what it means to be Ukrainian today. Progressive fashion designer Anton Belinskiy’s latest collection uses the Ukrainian blue and yellow flag for his inspiration. “Ukraine has a very rich heritage,” he says. “I wanted to transfer these local values and transfer them into fashion.” The 25-year-old’s reworking of the national colours demonstrates that his pride in his Ukranian identity, and the designer chooses to make and produce all of his collections locally, despite the fact it would be easier to move to one of the larger fashion cities like Paris or London. A former Ukrainian Venice Biennale representative is artist Zhanna Kadyrova, who in 2013 was given the domestic Pinchuk Art Center Award for her provocative painting which plays on the traditional values of Russian public art. The winning piece, Monumental Propaganda, remarks on the “diminishing heritage of former Soviet traditions” as Kadyrova explained during her acceptance speech. Public art has become hugely important in the protests around Independence Square in Kiev. A statue of Valery Lobanovsky, the former coach of football club Dynamo Kyiv, has even been wrapped up for protection by activists. At the end of January, and as the freezing crowds continued to shout for a “New Ukraine” in the streets of the square, notorious Ukrainian street artist Roti unveiled his contribution to the cause. The two-meter and four-tonne sculpture, which is also titled New Ukraine, depicts a carved woman’s face emerging from its depths, a calming and beautifully poetic statement that has garnered international focus. From the streets to gallery walls, lines are being blurred between protest and art, activism and installation. As the Ukrainian opposition calls for constitutional change, so does Ukrainian art. Independence Column in Kiev’s city square has become the site of an impromptu installation. Encased in metal boards and wooden pallets, the various images illustrate jailed opposition leader Yulia Tymoshenko and anti-Yanukovc graffiti. The column has been dubbed the metal ”tree”. It has come to symbolise the unrest in Kiev. Critics have argued that works of art whose sole purpose is to enrage and rile the masses should be confined to galleries and museums. We see that in Ukraine, any attempt to cage this art has failed, and that it has literally spilled out onn to the streets.